General Motors has chosen XR-5 as its material of choice to line stormwater ponds at its North American manufacturing facilities in Indianapolis, Kansas City and Lansing. General Motors has chosen XR-5 as its material of choice to line stormwater ponds at its North American manufacturing facilities. 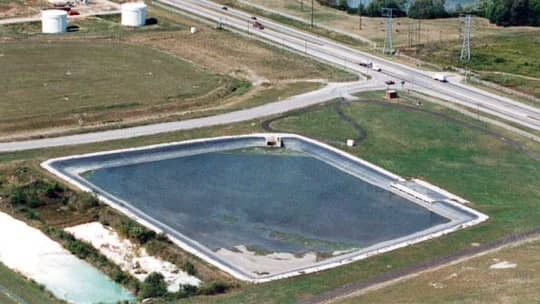 This particular 250,000 sq ft impoundment receives all of the storm runoff from the GM Indianapolis final assembly plant. Numerous pollutants are not a worry for the Plant Engineering staff because they know the XR-5 will perform without maintenance problems. GM has also installed XR-5 stormwater impoundments at their Kansas City and Lansing, MI facilities.